As a kid growing up in the UK, it’s hard not to have been a fan of Gerry Anderson and his puppet based TV programs. Whether it was the aqua adventures of Stingray, the dark action of Captain Scarlet or the far future science fiction of Terrahawks, Gerry Anderson’s television shows where everything a growing boy needs; action, adventure, heroes and futuristic technology. Out of all of Gerry’s creations it’s Thunderbirds that has had the most resonance. Thunderbirds, also known as International Rescue, where made up of the Tracy family and some friends as well as an array of super high tech vehicles and rescue equipment. International Rescue could get to a disaster, evaluate the problem, and get the necessary equipment there quicker than anyone else. Natural disasters weren’t the only adversaries that the Tracy family had to face because the malicious Hood was always on their tail. Considering that Thunderbirds was made in the 60’s (the show celebrates its 50th Anniversary this year) it has aged really well, unfortunately the same can’t be said for Thunderbirds previous translations to the tabletop. You may be surprised to hear that Modiphius’s latest Kickstarter project isn’t the first Thunderbirds boardgame; that honour goes to the Thunderbirds Game, released during the TV show’s original airings back in 1966. Although the game has many features that modern board gamers might scoff at, such as the dreaded roll and move that plagues many big commercial games, it stuck with the theme making players work as a team to rescue people from disasters and reveal the identity of the hood. 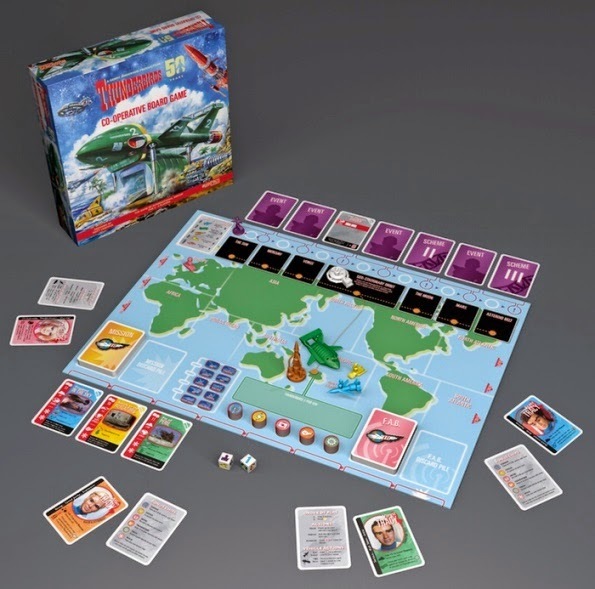 In 1994 Thunderbirds International Rescue Game was released and although it had players trying to avert well written disaster scenarios, the game itself was based around moving pegs into little bins and is a strictly competitive game. As recent as 2002 saw the release of Thunderbirds Are Go: International Rescue Board Game. Again it was a competitive board game, where players had to be the first to load up Thunderbird 2. The twist was that that player’s pieces could be physically launched up into the giant green carrier via a plastic catapult. Neither of these games truly captured the theme of International Rescue and look like the product of someone throwing a simple boardgame together with an established licence. In hindsight, it seems obvious to make a cooperative board game out of Thunderbirds. In a cooperative game players work together to beat the game, not each other, and the best cooperative games are those where the options available to each player are different. There’s a lot at stake in transforming Thunderbirds from a beloved TV show into a board game, not only do you have the legal issues of dealing with a licensed property you also have to make the game as true to the shows ideals as possible for fans of a program 50 years old. So Chris had the ear of the licence holders, but didn’t have a game yet. He knew that he wanted to create a board game, something new to Modiphius who to this date had only made roleplaying game rules and source books. Chris also had a clear vision that Thunderbirds needed to be a cooperative game and for the designer of his Thunderbirds board game Chris had only one man in mind. “If you're going to make a co-op you go after the top of the list and that's Matt”. Matt Leacock has probably the best reputation in the board game world for designing cooperative games, his board game Pandemic is the winner of many international awards, and is a staple amongst any board game collection. For Chris getting Matt Leacock to design Thunderbirds was essential so he arranged a meeting at Essen Spiel, the problem was, Matt had never seen Thunderbirds. “There we pitched him the idea, he hadn't watched the show before though he knew of it. He went away and watched it with his family and was hooked.” Chris now had the licence, and had his star designer on board; it was now Matt’s job to take the concept into a working game and it wasn’t long before things fell into place. A working game is only half the design problem. Gone are the days when a board game can get away with cardboard chits and simple plastic tokens. The modern board game buyer wants something more sophisticated from their game and Chris new that he had to bring the iconic Thunderbird vehicles to the game as well. It’s just not Thunderbirds without the unmistakable giant green form of Thunderbird 2. So how does one achieve this, it’s back to Chris to tell us. Practicality was a big deal for Thunderbirds, each Tracy brother and Lady Penelope is represented by a peg that can be moved between vehicles. 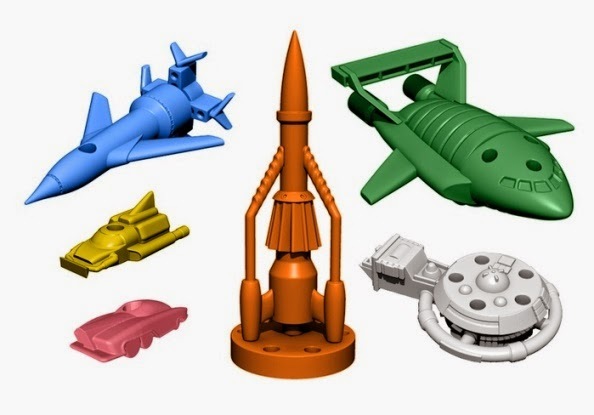 But this isn’t the best part, Thunderbird 2 can be physically loaded with the various rescue vehicles, there’s no putting a token on a sheet you actually put Thunderbird 4 into Thunderbird 2! 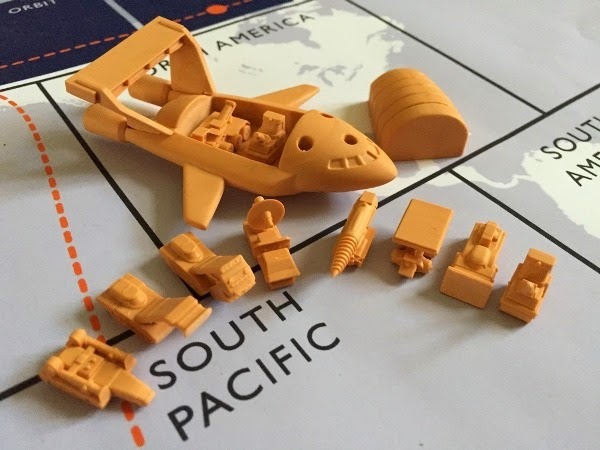 Once the prototypes have been tested and checked it’s time to send them to the manufacturers; “The next step is to make any changes, and send them to the Chinese factory who then do 3D prints themselves (they'd be too fragile to ship). They then digitally scan the 3D printed models into software and then produce the high pressure injection moulds for the plastics from that”. This process of creating the injection moulds, commonly referred to as tooling, is where the major expense in any board game project is. Injection moulding tools can easily cost in the region of $15,000 and to achieve a suitable return from that investment you want to make as large a print run as possible. “The minimum order for most factories is 3000 units, and really 5000 units if you want a cost cheap enough that you can make money selling them so that can be another $40-$50k.” This is why so many board game creators, like Chris and Modiphius, are heading to Kickstarter to fund that investment. Kickstarter is where people like you and me come into the development of a game; it’s our backing of Kickstarter projects like Thunderbirds that can allow these games to move from a concept to a finished product we can play on our tabletop. As I write this The Thunderbirds Co-operative Board Game still has a few weeks left on Kickstarter, it has raised over £150,000 but as with most projects the more money that can be invested up front the more than money can be used to make a better looking game and higher quality pieces. Well written review. I'm browsing the KS page now, I would have missed this! Thanks! Thanks, t's a great little game. Love the retro feel of these miniatures, this game looks like a blast! I though the miniatures looked good, but being able to load up Thunderbird 2 is he icing on the cake. I'm looking forward to seeing how it plays, Matt Leacock has a really strong track record so it should be good.